This is my fourth review from the LEGO SOLO: A Star Wars Story and I had finally seen the movie. It is a good movie which give me a glimpse of Corellia and other associating new planets but yet fail to live the expectations of other recent Star Wars movie like Rogue One. Well, I am not going to talk much about movie plot for this review. So be rest assured that there are minimum spoilers in this coverage. 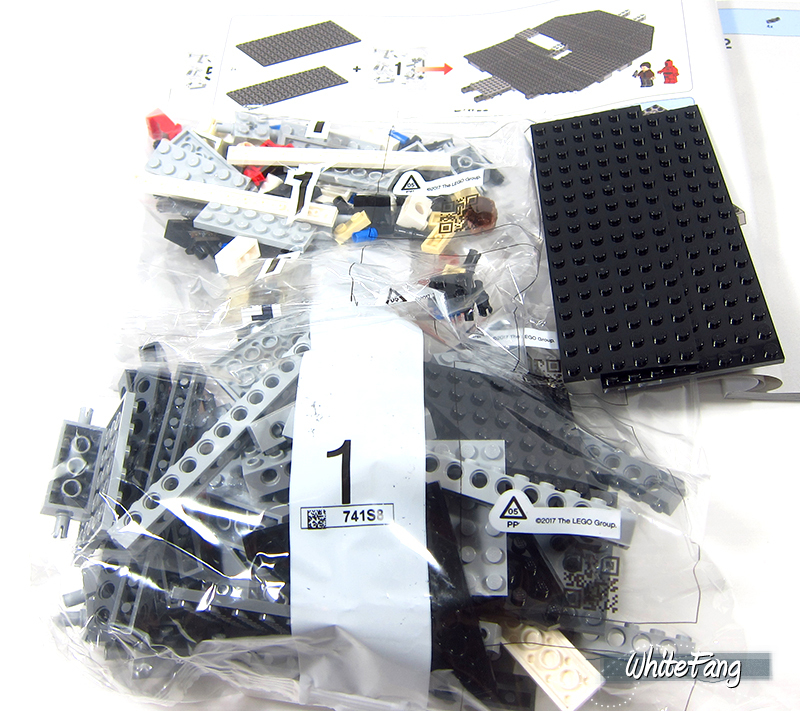 Previously, I had reviewed the 75209 Han Solo's Landspeeder, 75210 Moloch's Landspeeder and 75215 Cloud-Riders Swoop Bike. 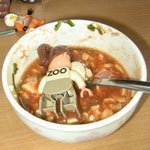 This review can only be made possible with LEGO CEE and Eurobricks Ambassador, Jim for facilitating this reviewing opportunity. Although this is a late review to the scene but I still hope you find this review useful. 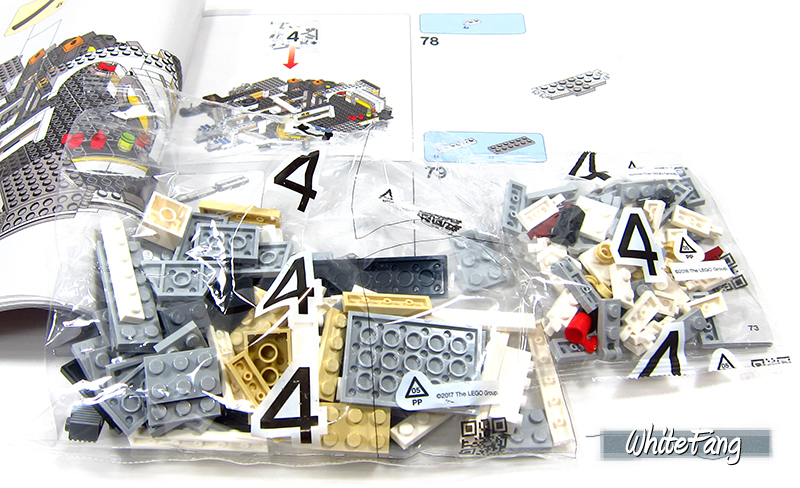 One important thing to note, I am entirely reviewing this with nil Millennium Falcon building experience. 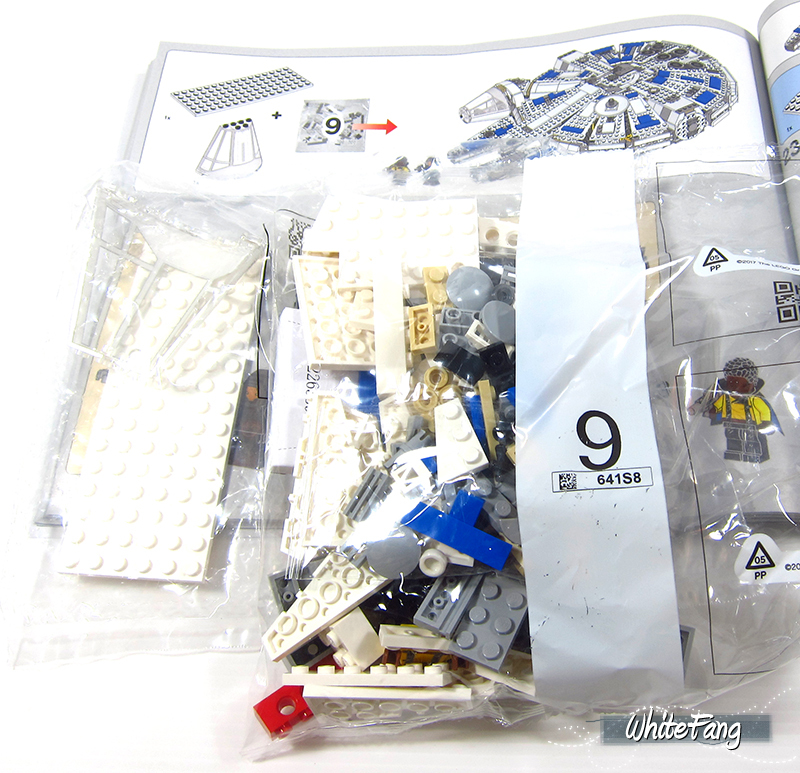 I had bought some older variants of Millennium Falcon but I haven't build them yet due to space constrain. Therefore, the experience which I intend to share is from a new builder which TLG seek to inspire a new generation through this iconic design. 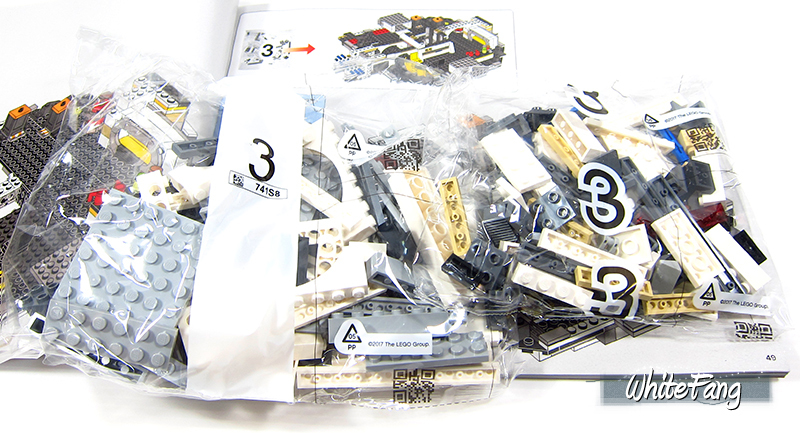 Furthermore, I am personally pleased to complete my current collection of LEGO SOLO sets with this last addition. 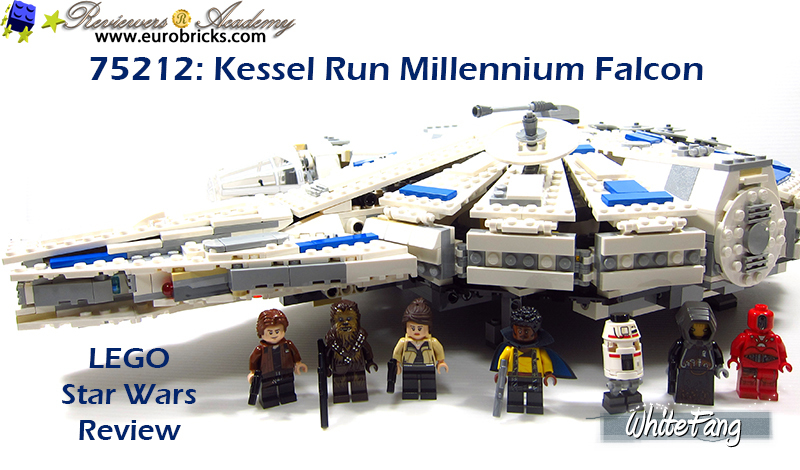 Without further ado, let me share the reviewing journey for the legendary kessel run. This new redesigned Millennium Falcon which is featured in the SOLO: A Star Wars story movie is targeted to create interest with new Star Wars fans through this iconic Millennium Falcon. It was owned by Han Solo which he won from Lando Calrissian in a gamble. This will be explained in this movie. Then, we have Rey taking over the controls from Han Solo in end of Episode 7. 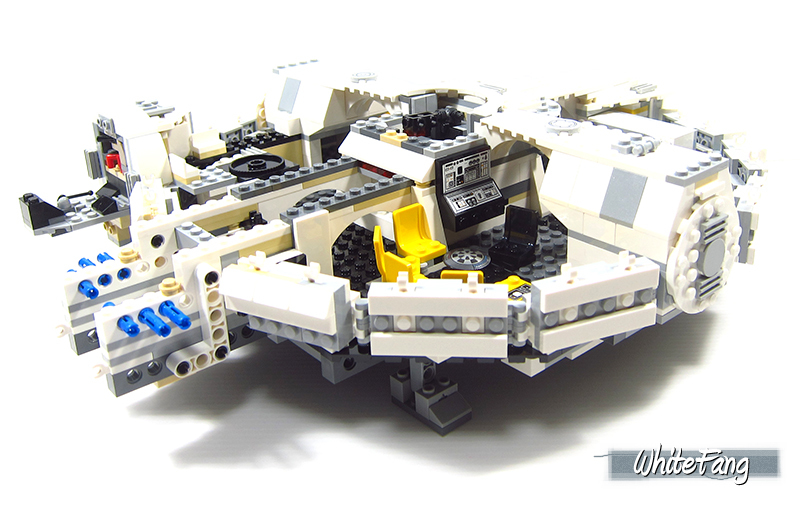 Since the start of LEGO Star Wars in 1999, the 7190 Millennium Falcon was the very first minifigure scale play design. 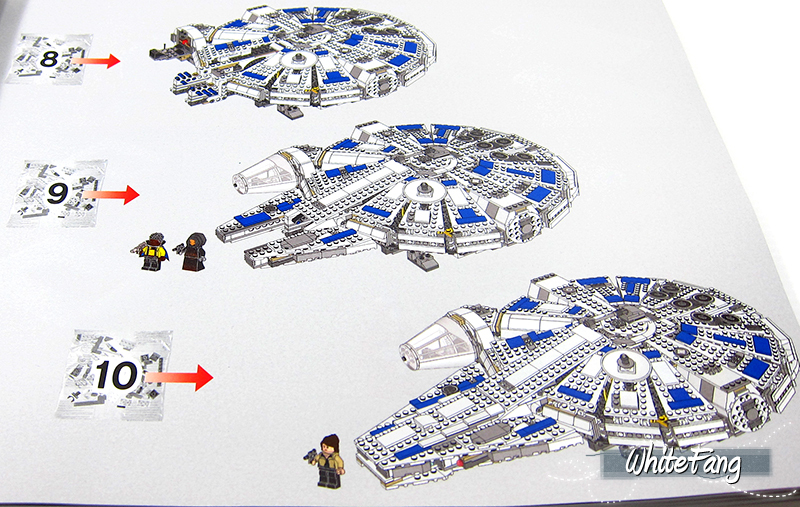 Then, it had an improved design and minifigures in 2004 with the 4504 Millennium Falcon. 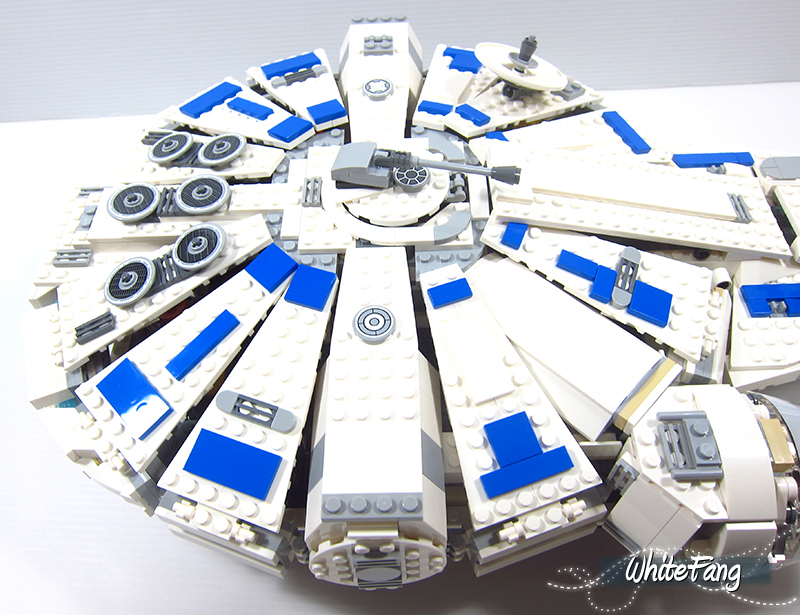 Subsequently in 2007 and 2017 with a decade apart, the largest UCS Millennium Falcon was released under 10179 and 75192. After 2004, TLG had released a version in 2011 under 7965 and in 2015 under 75105. 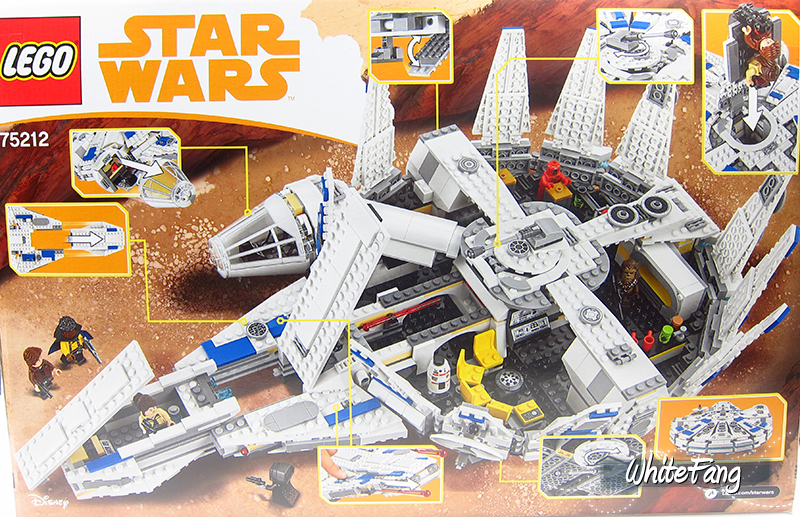 This is indeed a long march since the dawn of LEGO Star Wars where this iconic design had been rehash numerous times. The sealed box came with these building content. 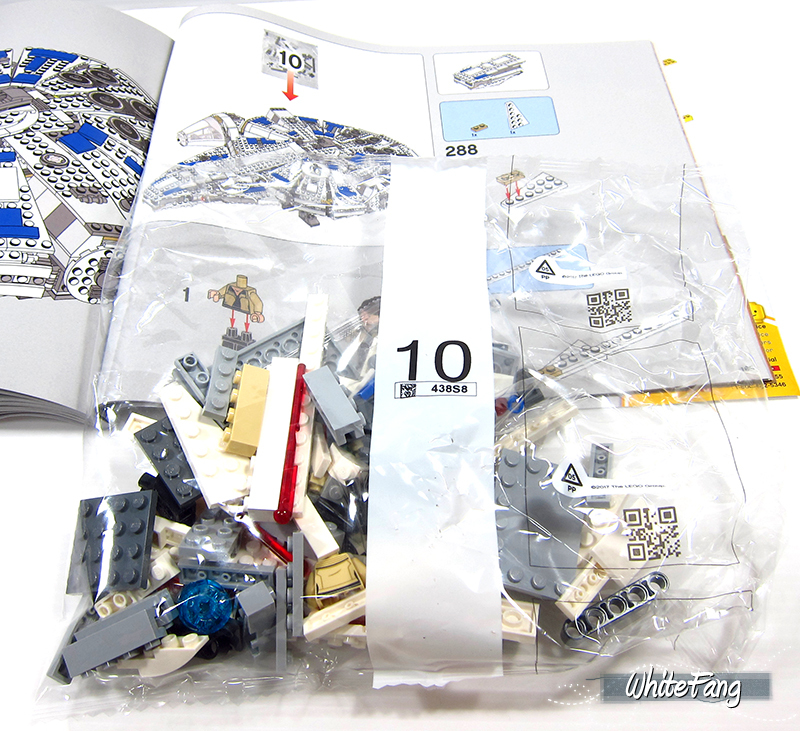 The instruction manual and sticker is kept in this manner. The entire built is divided into 10 significant milestones and it took me about 4.5 hours to finish building it. The pacing for entire building experience is excellent and it does not feel too tiring. After the set is built, these are the remaining spare parts. The content also included a sticker sheet. Firstly, let's go through the minifigures and droids section. From left, we have the DD-BD droid, Kessel Operations Droid, Quay Tolsite, Qi Ra, Han Solo, Lando Calrissian and Chewbacca. 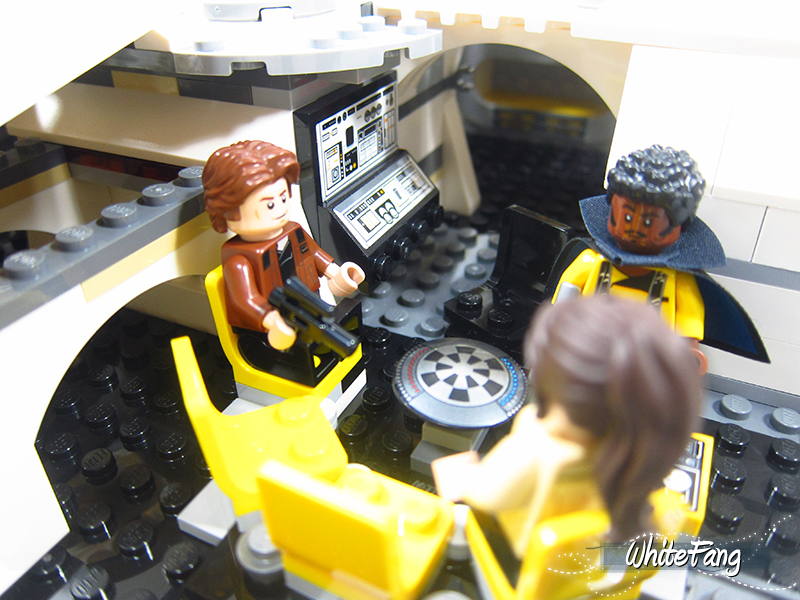 All of the minifigures and droids are unique, except Han Solo and Chewbacca who had reappeared in this SDCC 2018 exclusive of 75512 Millennium Falcon cockpit. These are the minifigures come with alternate facial expressions. 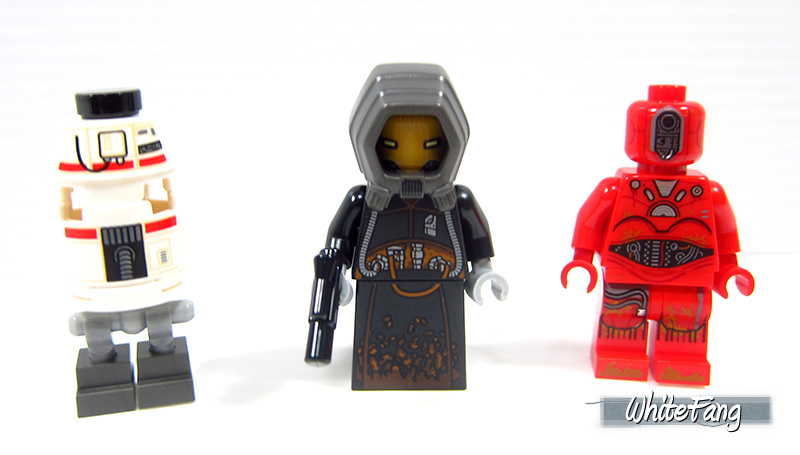 I am also pleased these minifigures and droids also came with back printing as well. These are the main cast from the Millennium Falcon. 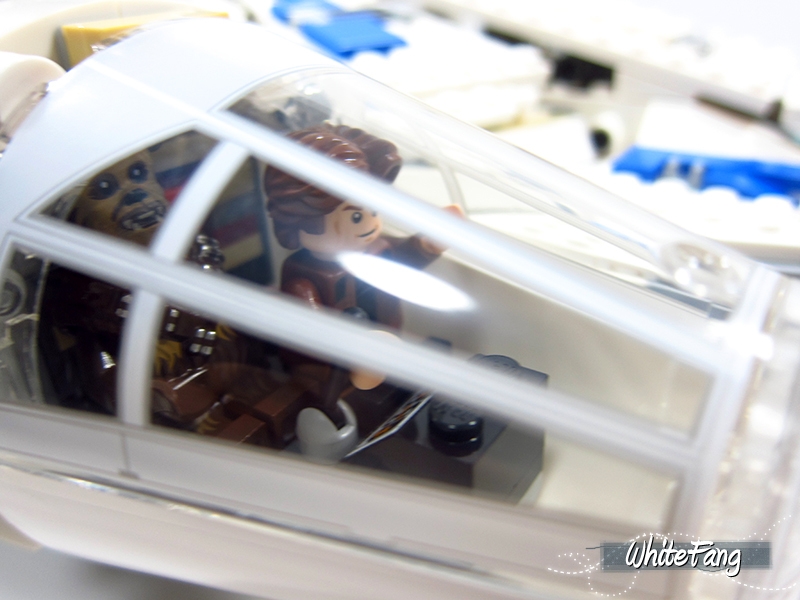 Qi Ra minifigure had appeared 3 different designs so far and in this variant, her hairpiece is rubbery. She used to work for Lady Proxima before putting her sad life aside and joined the Crimson Dawn. She is now a capable strategist and advisor to Dryden Vos. Han Solo was a smuggler who became a leader in the Rebel Alliance to restore the Republic and a key leading figure in the defeat of the Galactic Empire during the Galactic Civil War. Han Solo had appeared 41 different designs so far. Chewbacca was captured and was rescued by Han Solo. Ever since, there were best buddies till the end of time. Chewbacca had appeared 7 different designs so far. Before we knew Lando as the keeper of Cloud City, he was actually a smuggler and now aim to retire by becoming a full-time gambler through sabacc. Lando had appeared 7 different designs so far. Do note that his cape is pretty stylish with a navy blue and black borders. All of these droids are unique to this set and they are actually found in the Kessel Mine. The DD-BD droid was a captured slave to carry out mining operations. Quay Tolsite is a member of the Pyke Syndicate and is the caretaker of the Kessel Mine operations. 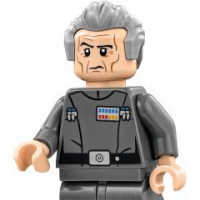 His minifigure is the most well designed and accurate with the movie reference. The Kessel Operations Droid took care of the main controls and was directed by Quay Tolsite accordingly. Which outfits do you prefer? 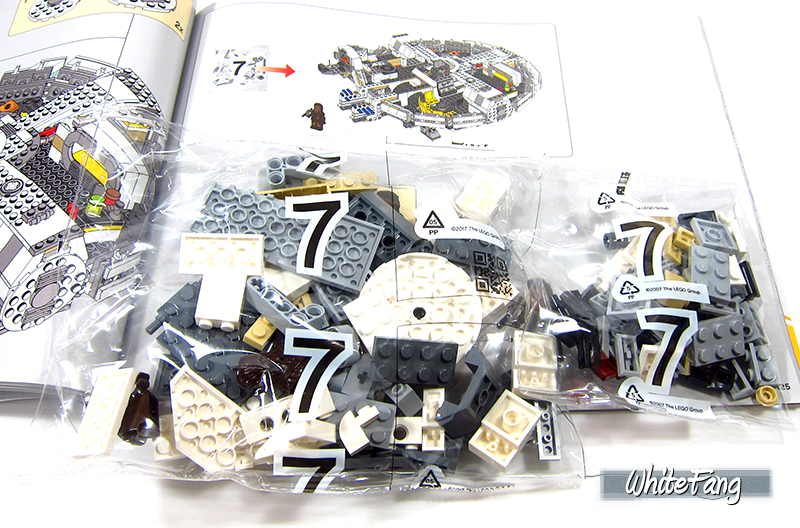 The packet 1 focused largely on the building of the Millennium Falcon base. You can take a closer view of the front and bottom of this building stage. 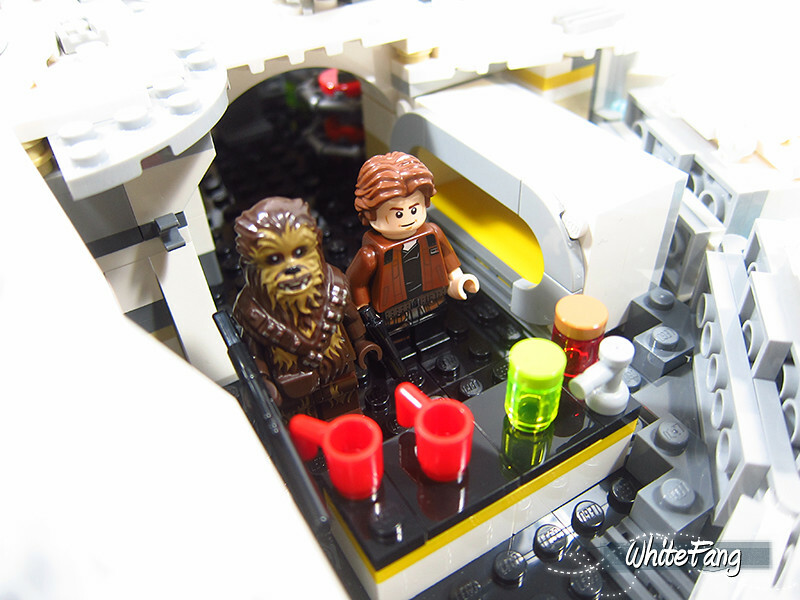 Packet 2 focused on the built of Millennium Falcon interior highlights like the cargo hold, bunk, drinks and seating area. You can take a closer look at these various views from the rest area, bunk area and cargo hold. 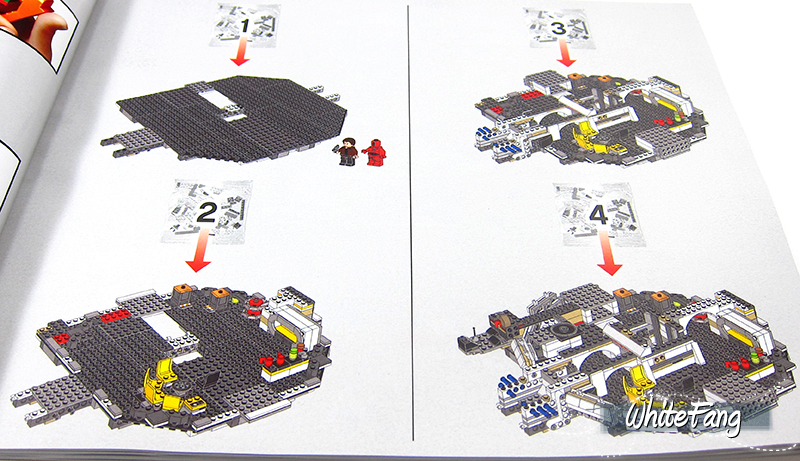 Packet 3 is building the interior surroundings which we will see the ship begun to form from the front and side. You can take a closer look from the front view. Packet 4 focused on forming sides of the Millennium Falcon and the cockpit base. 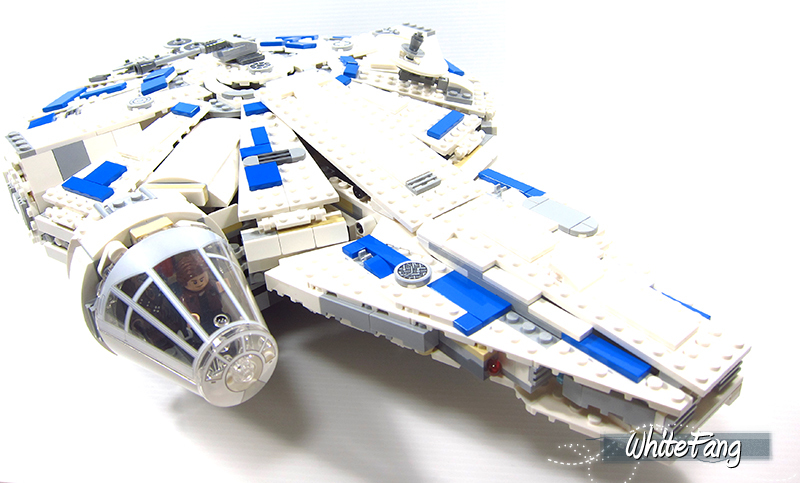 Packet 5 focused on completing the rear engine exhausts and sides of the Millennium Falcon. Packet 6 focused on building the side structure including docking entrance pillars. 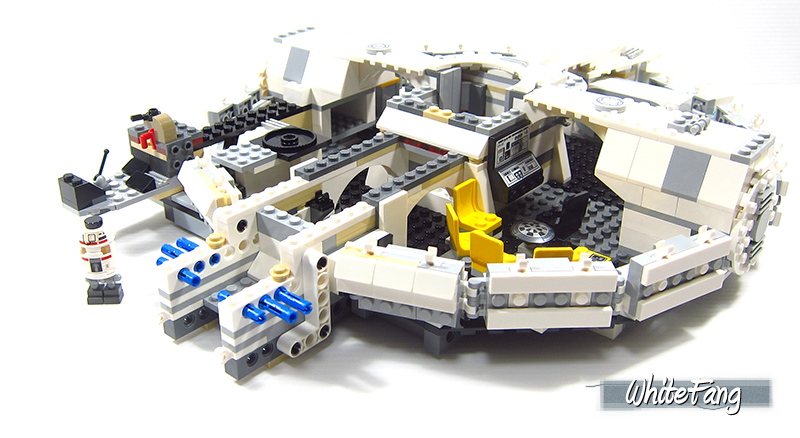 Packet 7 focused on building more of the Millennium Falcon's interior. You can view some of the close up images from the front and bottom including the rotating laser cannon. 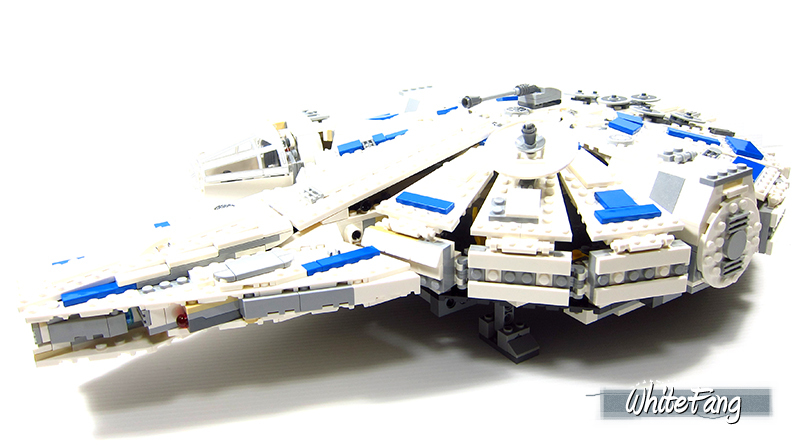 Packet 8 focused on building and forming the top opening flaps all around the Millennium Falcon. You can take a closer look from the front view. Packet 9 focused on almost completing the Millennium Falcon minus the auxiliary craft at the front. Just by viewing this close up front view, don't you think we are almost complete the building? 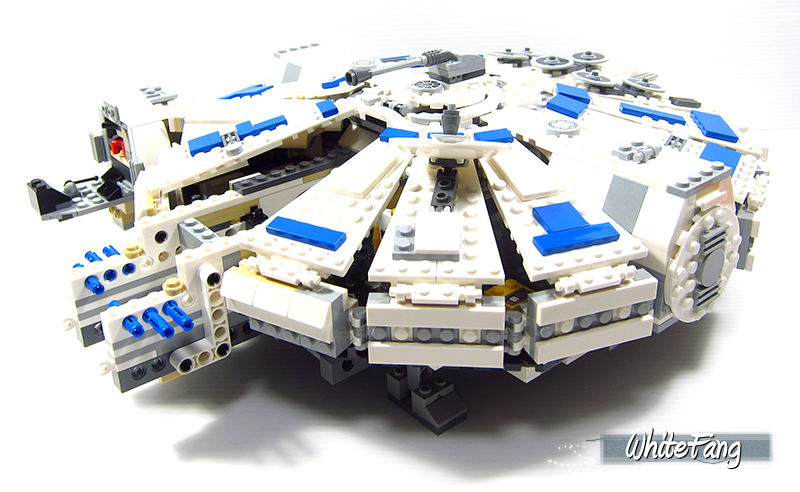 The Millennium Falcon is measured at a height of 11cm high, 48cm length and 30cm wide. 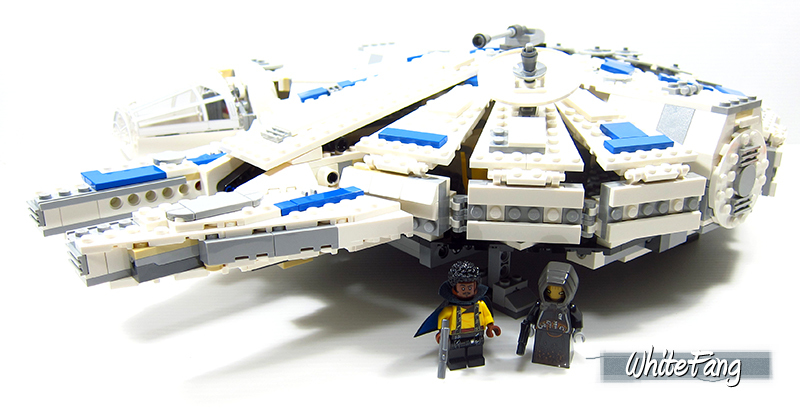 The Millennium Falcon is manufactured by the Corellian Engineering Corporation with a model of YT-1300. It has an atmospheric speed of 1200kph and equipped with dorsal and ventral single laser cannon turrets under their weapon arsenal. It just require a crew of two to properly fly the Falcon: pilot and co-pilot. 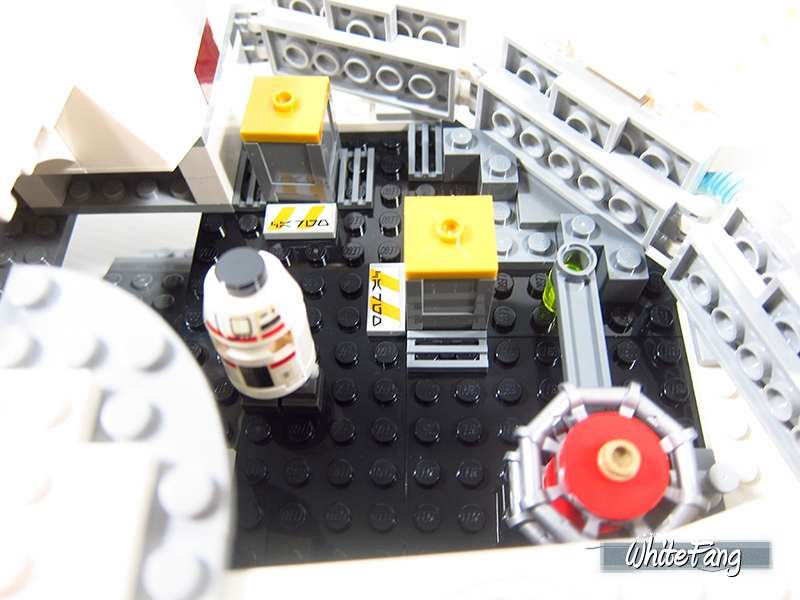 The Cockpit can can seat two extra crew members at the communications and navigational stations which is not seen in the above LEGO model due to space restriction. In case anyone is wondering what exactly is kessel run? The Kessel Run is a legendary navigational route through the chaotic space that surrounds the Kessel planet. The local Si'Klaata Cluster and the Akkadese Maelstorm are shifting systems of dangerous stuff across hyperspace travels. In a nutshell, it is a bloody shortcut with hell of traps and pitfalls along the way just to save precious traveling time. This iconic spacecraft is equipped with state-of-the-art weapon cannons which can be found at the top and bottom of the ship. For increase playability, this model come with dual shooting missiles at the side. This is the rectenna which processes data to assess the Millennium Falcon and its surroundings. It uses passive electromagnetic gathering surfaces as well as active-bounce signals. These are the six dorsal heat vents at the rear of the ship. The igniter is where the fuel combustion output is taking place. This is the iconic cockpit which can also be removed from the front. Do note that the landing gear is non-retractable and it can also be seen here. You can view some of the close up exterior images of the Millennium Falcon from the front view, side view, rear view and bottom view. 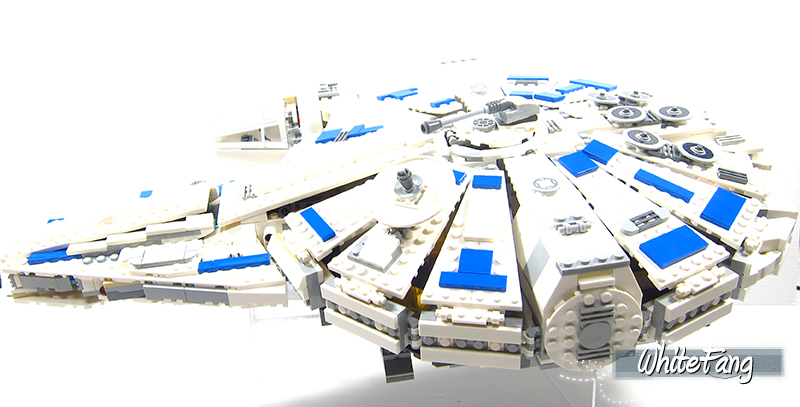 This Millennium Falcon variant is owned by Lando Calrissian where he had made it his home in space. 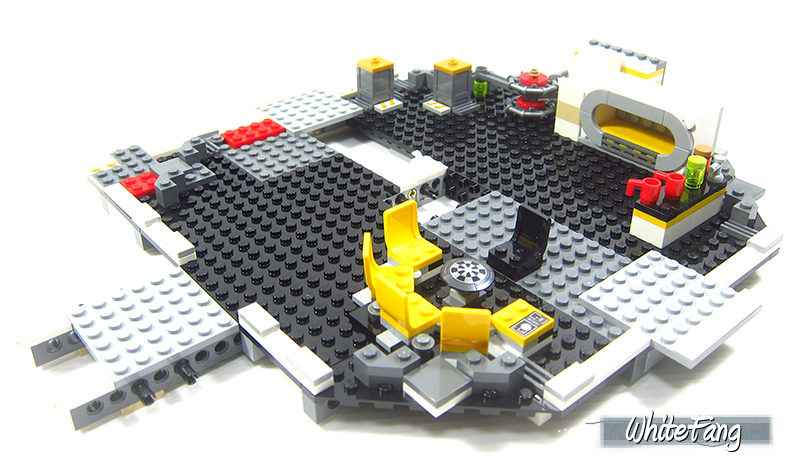 The forward compartment houses a lounge for the ship crew which includes a drinks bar, holotable for playing dejarik and sound system or control panel. It even had a wide bunk for the crew to sleep comfortably. It has a boarding ramp which enable the crew to enter from inside or outside. 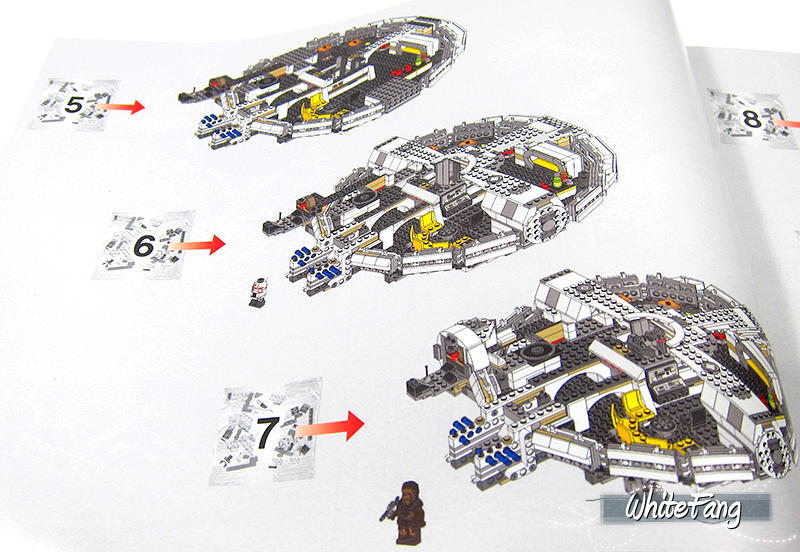 By opening up the top flaps of the Millennium Falcon exterior, you will be able to notice four distinct sections. namely nearing the cockpit, cargo hold, rest area and drinks counter. This Millennium Falcon variant also included an escape pod bay (configured for 2 pax) which can be launched at beneath the top laser cannon. There is also a stowed auxiliary craft which was never seen in the original Millennium Falcon design. It can be lifted up through this front mechanism. It can be easily slide out from the front and detach from the main spaceship. 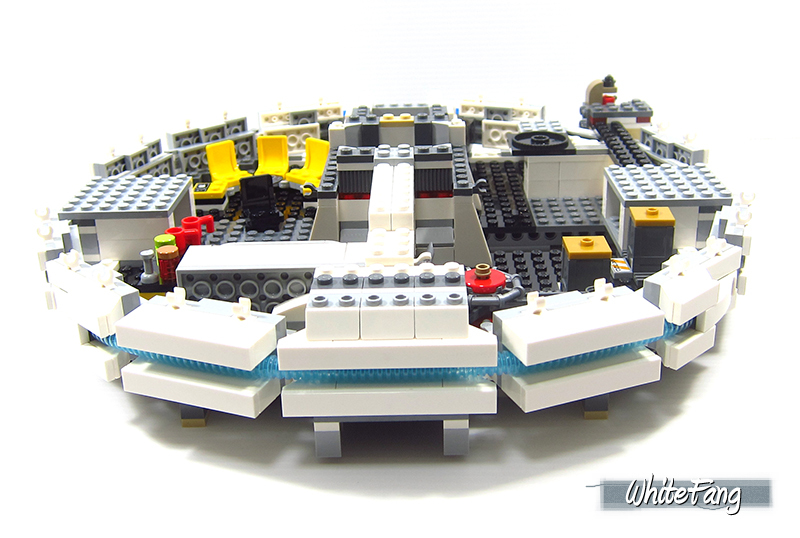 What do you think of this version or variant of the Millennium Falcon? 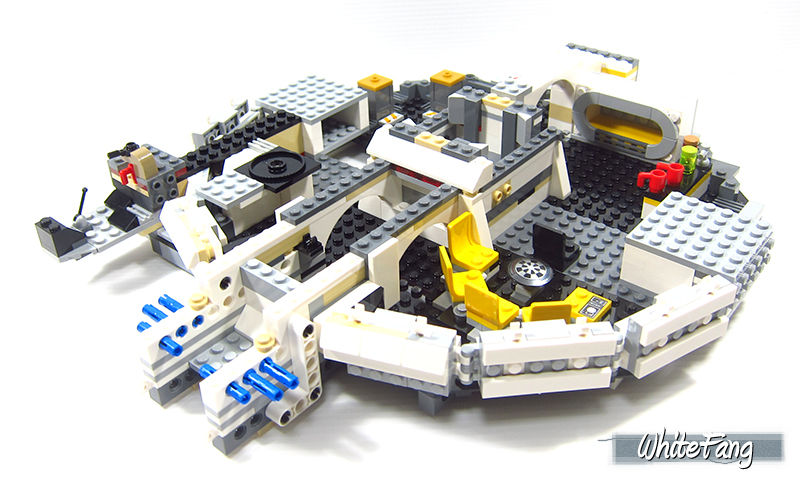 To conclude, this is a pretty decent Millennium Falcon building experience. I love the minifigures' assortment and I have no issues or rant about it. For the Millennium Falcon design, I find it strange to have that auxiliary craft at the front to make it complete and I am pretty sure Han Solo got rid of that feature to shave some weight. My only grip about this Millennium Falcon is the colour of white. 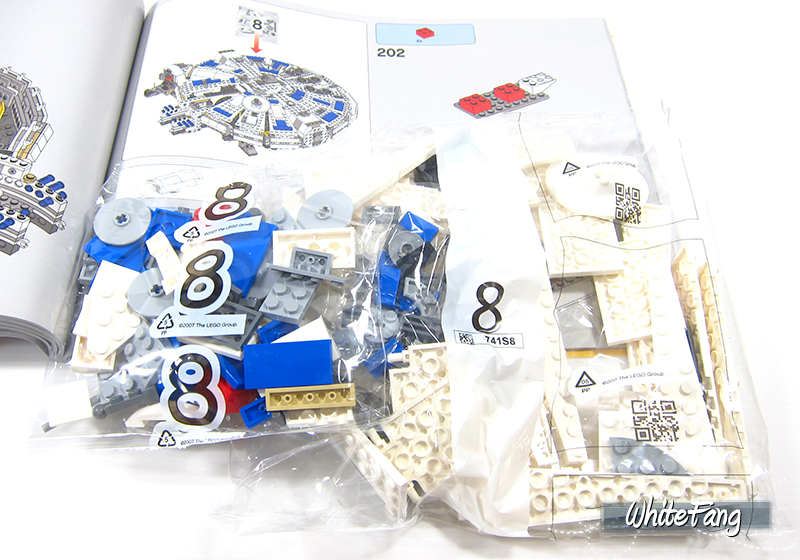 I am not fond of having a white Millennium Falcon cutting with blue stripes, knowing the case that it won't go down well in time with the white bricks becoming yellowish. This is pretty tragic and yet unavoidable. Even I manage to hide it away from sunlight, it still manage to get the whole model turning into a piece of yellowish dull crap. I don't have a known solution for this Millennium Falcon and I can understand why they had to design white for the movie and of course to tell others that is not the regular Millennium Falcon which we are getting. Many of the interior features are largely similar with the predecessors. This ship is worthy for display and I am very glad to have it in my collection despite of the colouring. My advise to get it only if you are a great fan of SOLO movie or if you do not own any Millennium Falcon. 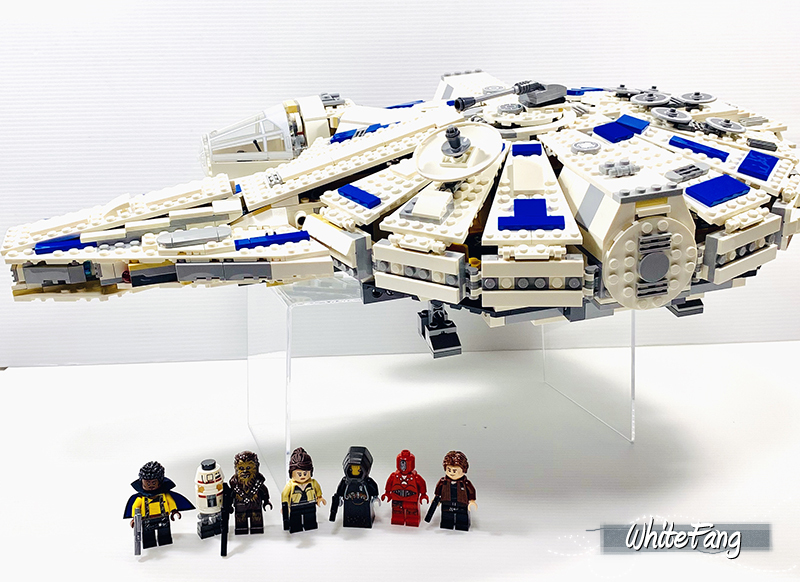 If you are bend to get the minifigures, getting the Millennium Falcon doesn't warrant the hefty price tag unless you are a Millennium Falcon collector. You don't need so many and I am very pleased to have my third Millennium Falcon in my collection, right after 7965 and 75105. 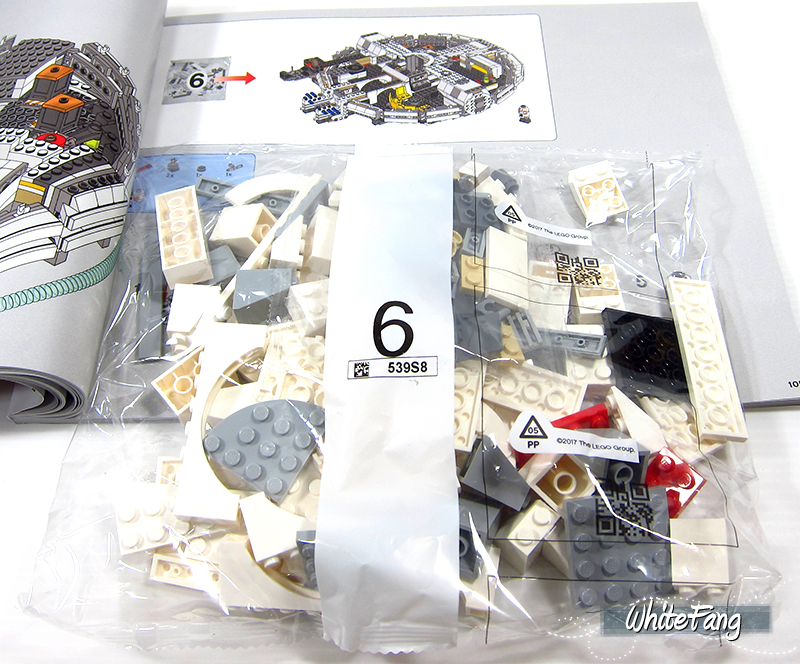 Owning these 2 sets are great enough meaning to show the past, present and future of the Millennium Falcon's evolution. Not really my taste but were the gap between the panels so big in the 75105? 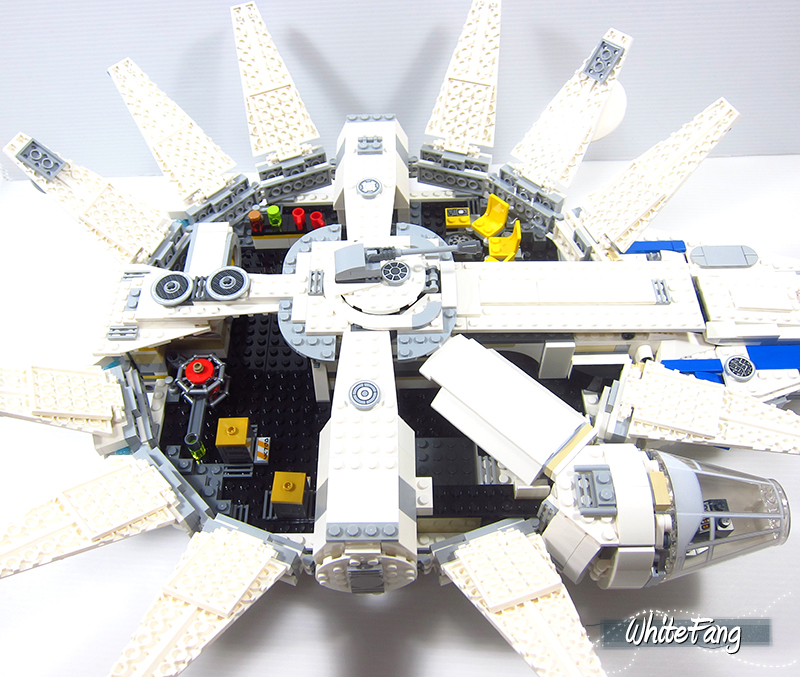 i sold it when i got the ucs one but i don’t remember those gaps..
A pretty decent set overall. The thing that bothers me most is the dejarik table setup being right in the middle of the room, blocking the "walkway" to the cockpit! That area should have been designed much better IMO. This is an amazing review for a fantastic set! Cool review. I really like how LEGO improved the build compared to 75105. It is much sturdier now. Because there are solid plates from the middle section to the aft instead of a flap you can grab it there and swoosh it pretty hard. I love the colours, it's a real eye-catcher, especially on vertical stand. I was considering whether to write this or not and I am still not sure if my post can make any positive impact but I guess without criticism the improvement is less likely. Although some comments are specific to this particular review, in general my criticism extends to many 'Reviewer Academy' reviews, at least those I noticed lately. It seems far to common for people to just automatically say 'thanks, cool review, nice set' and I wonder how much is that just a habit or result of general sympathies and loyalty. Subject of the review is relatively old set and there has been many good reviews made previously. Compared to the existing reviews I struggle to find much original content, thoughts or really anything really worthwhile in this review. The photography is, frankly, not very good. It is even more apparent here than in other reviews, because of the primary color of the model. I understand there is probably a language barrier to some extent, but sometimes the text is confusing or even contradictory. I fully acknowledge that there is effort that goes into writing this and the intentions are all great. But really I don't see so much of a value but for the authors themselves, as they can enjoy making it and improving their skills. And I have no problem with that as long as it actually works like that and people provide some constructive feedback... which I don't think is happening. I don't know... maybe I am searching a problem where there isn't, I sure don't mean to insult or discourage. Thanks guys for your feedback and comments. The gaps were also there in 75105 if I remember correctly. Thanks for sharing. Didn’t know that the reinforcement is an improved design from the previous MF. Thanks Kristof for sharing your honest views. It is where such constructive critics could help the reviewer to improve for future reviews. I really do welcome such feedback and I know you don’t bear ill intentions. Noted there are a lot of reviews out in the Internet, as outlined by Brick Insights. However, there are nil review for this set on EB. Doing a review does not mean it has to be the latest. It could also be an EOL set. In this way, I do not think it is recommended to only review or share the latest releases as and where it is. Multiple reviews are always welcomed as it offer different perspectives. Agree the photography is not very ideal as the base colour of the model is white and my floodlights had created unnecessary harsh light/shadows only after the photos are being processed when uploaded onto computer. I will take note of it and improve on it further. Noted that the write up may not be coherent at times. I will pay more attention when I put my thoughts together. It may misrepresent wrongly and I apologies if is confusing for you. Interesting review! As Kristof pointed out I do agree that the photography can be improved, maybe by using a grey backgound? Noted there are a lot of reviews out in the Internet, as outlined by Brick Insights. However, there are nil review for this set on E﻿B. Doing a review does not mean it has to be the latest. It could also be an EOL set. In this way, I do not think it is recommended to only review or share the latest rele﻿ases as and where it is. Multiple reviews are always welcomed as it offer different perspectives. That's right. Although I think that if the review is not among the ones released close to the set release dates, it would be nice if it had some added content, rather than just a quick overview of what, frankly, most readers already know. Justification that it is a review new to Eurobricks is perhaps valid, but I don't think it's self sufficient. 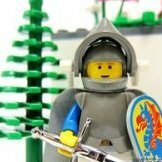 Maybe I am wrong but I expect a typical Eurobricks member to follow other profound lego related sources. So again, it would make much more sense if your reviews, being somewhat late to the party, scored extra points with something else. Agree the photography is not very ideal as the base colour of the model is wh﻿ite and my floodlights had created unnecessary harsh light/shadows only after the photos are being processed when uploaded onto computer. I will take note of it and improve on it further. I'm no photography expert but it looks to me that the ISO is way to high and/or the editing done in order to suppress the background was overdone. As someone suggested, other than white background would be better for such model. Apology accepted... :D I'm just kidding. But again, given that this is not a first minute rush review to be the first out there on the internet, I would automatically expect somewhat higher quality as far as the written part goes. As far as the content goes, it is cool to express your own opinions and insights, but (and granted that it is the harder part, often neglected by people) it has questionable value if the explanation or reasoning is missing. "I really like the model and it looks good in my collection" - OK, that's cool, but what does it really say? Not too much in fact. I really admire Jang from Jangbricks for this particular reason. He says his opinions but he almost ALWAYS backs them up with concrete examples and comments on what makes him think that way. It is much harder than it seems, but I think a good reviewer should be capable of including that. And it's really something that can turn a boring uninteresting stock review into an original one, very much worth reading. With a grey background it will be easier to not burn the whites on the mf, you’re right. i suppose it’s the white that makes them more visible. I will add on the photography: one of the things to consider is not to overexpose. I have seen the photos first , then thought "it's Whitefang". You have the tendency to loose details in highlights. Simply stopping the overexposure should help, maybe also tuning down the contrast. BTW, I like to read reviews of not so new sets and this was enjoyable for me (I have not read any other of that set) although I have to admit I stopped when I reached the first photo which didn't allow me to see what the model really looks like. I just scrolled down more and saw even more overexposed pictures and called it a day. I was only curious if anyone found it distracting and saw Kristof's response. Thanks guys for your feedback and thoughts. I will certainly take heed and see what I can do for future improvments. I didn’t realise white on white had created so much problems and I only noticed it much later. Thanks for the review! 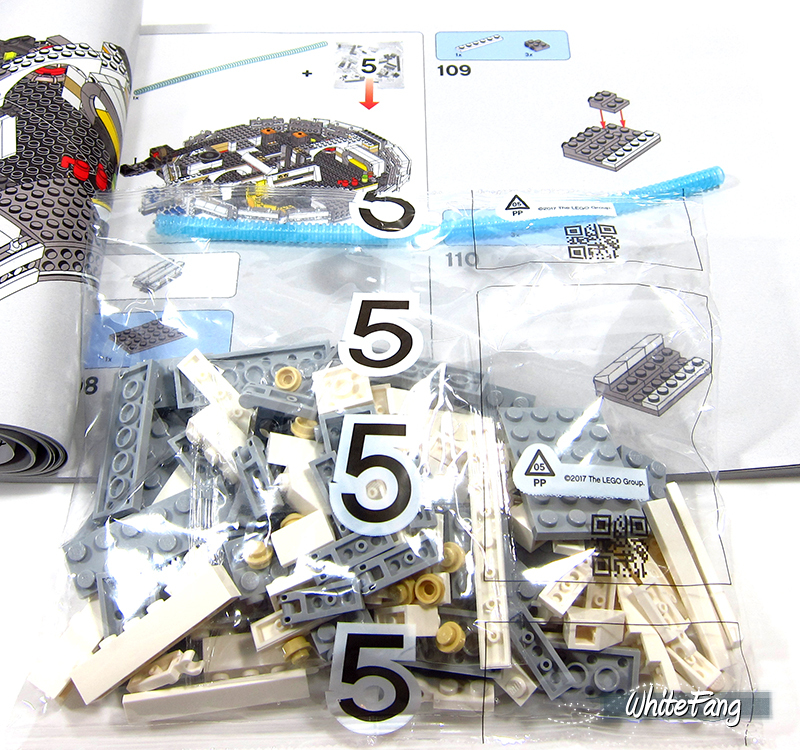 I always like to see what you build per bag, it's nice that you've included that in your pictures. This review reminds me, I've yet to build this set! 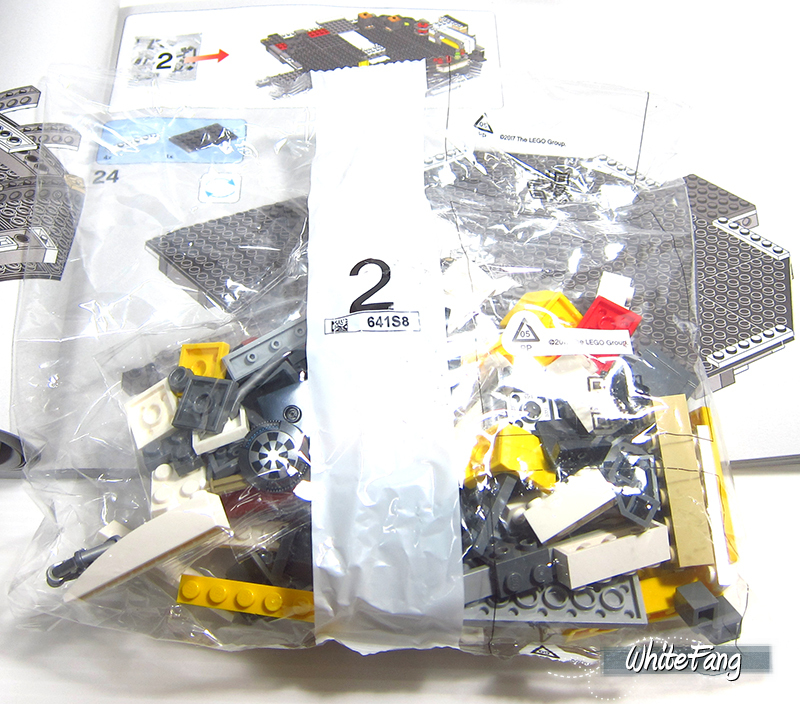 I mostly bought the set for the minifigs, not sure yet if I will display the set (i already have an OT MF) or break it apart again so I can use the pieces for other builds. What are you guys doing? 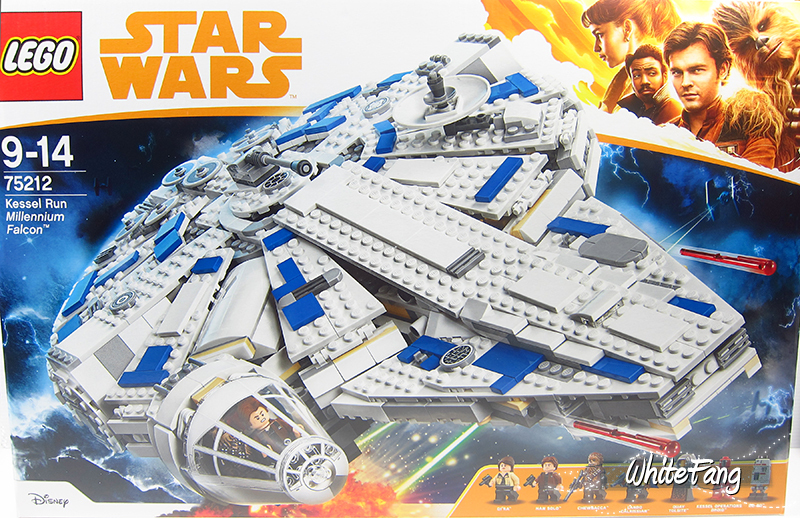 This set is alright, but the biggest problems are definitely the use of too many different colours (the white, grey, tan, even black... dont gel well together and make it look too messy, especially considering this is meant to be a brand new Falcon), and the gaps which have just gotten worse since the 2015 version, which the white colour doesnt help. 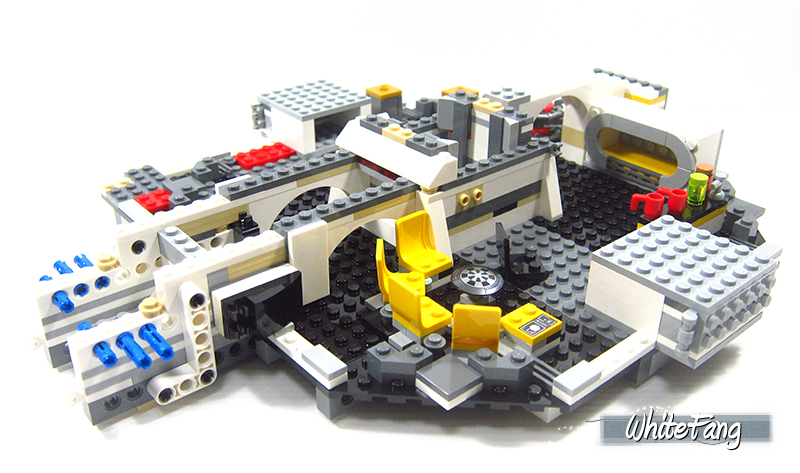 For example the back part for some reason doesnt open and instead is built into the ship. I guess for structural support, even though that wasnt an issue on the 2015 version, and just makes it look far more gappy. 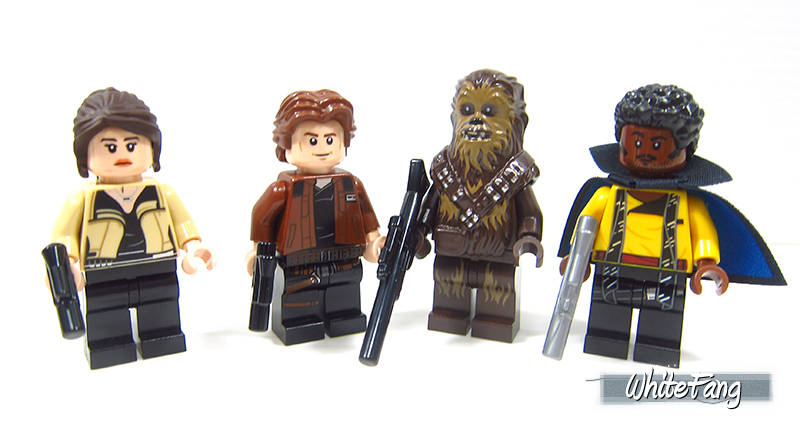 I love the minifigs though, especially Solo and Lando. Those are some great figures. Thanks for the review, Whitie! I'd like to get this set, but the price just makes it impossible. Sometime around 2013, LEGO just started jacking up the prices. I bought the last Millennium Falcon, and like it a lot. I'd like to get this as well, but it is about 30% more expensive. It's a shame. LEGO is probably making more off of fewer sales, but that's not ideal.